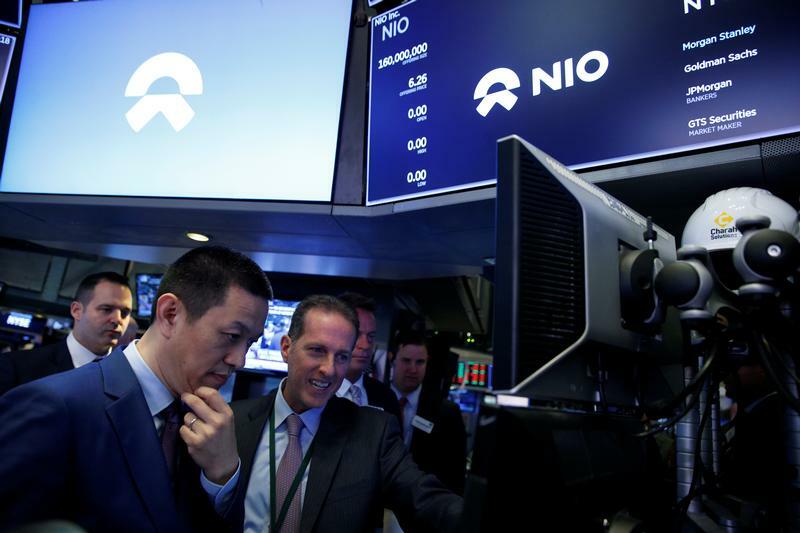 Bin Li, CEO of Chinese electric vehicle start-up NIO Inc., listens to trader Glenn Carrell (R) during the companys initial public offering (IPO) at the NYSE in New York, U.S., September 12, 2018. Nio, the Chinese electric vehicle maker, blocked the eight top investment banks that advised on its initial public offering in September from working for rivals by tying them up in year-long non-compete clauses, Reuters reported on March 29, citing unnamed sources. The banks involved are Bank of America Merrill Lynch, Citigroup, Credit Suisse, Deutsche Bank, Goldman Sachs, JPMorgan, Morgan Stanley and UBS. These were also the top eight banks worldwide for equity sales in 2018, according to Refinitiv data.